A power company in Shetland has claimed a breakthrough in the race to develop viable offshore tidal stations after successfully feeding electricity to local homes. Nova Innovation said it had deployed the world’s first fully operational array of tidal power turbines in the Bluemull Sound between the islands of Unst and Yell in the north of Shetland, where the North Sea meets the Atlantic. It switched on the second of five 100kW turbines due to be installed in the sound this month, sending electricity on a commercial basis into Shetland’s local grid. 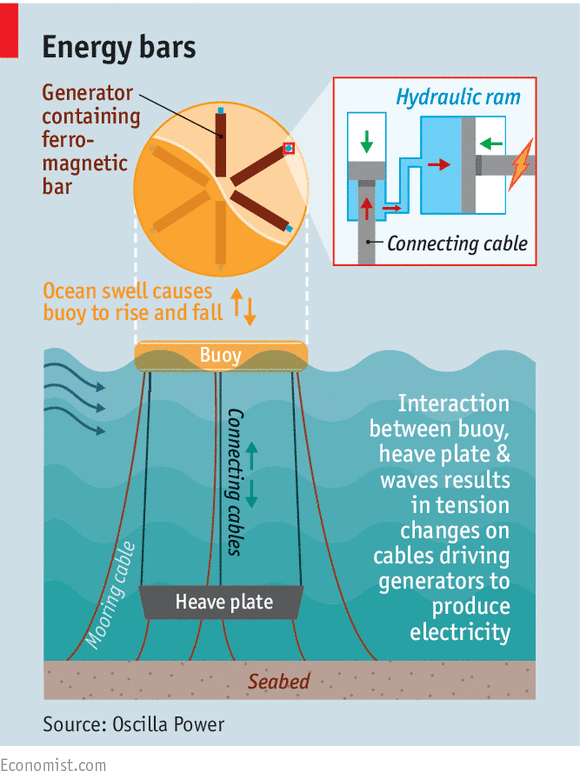 Existing tidal schemes use single power plants or installations rather than a chain of separate turbines. A French company, OpenHydro, says it too is very close to linking two tidal machines, off Brittany, to build a more powerful 1MW array. After a series of commercial failures in Scotland’s nascent marine power industry, including the collapse of two wave power firms, Pelarmis and Aquamarine, Nova Innovation’s announcement was applauded by environmental groups. Lang Banks, director of WWF Scotland, said: “News that power has been exported to grid for the first time by a pair of tidal devices marks yet another major milestone on Scotland’s journey to becoming a fully renewable nation. The islands, which are not connected yet to the UK grid, get most of their electricity from a diesel-fuelled power station which is supplied by tankers, despite having some of the world’s strongest and most reliable wind, wave and tidal resources. Shetland has also been the site of one of the UK’s most bitter disputes over renewable power. Thousands of islanders campaigned against an ambitious scheme backed by the local council to build the 370MW Viking windfarm, involving 103 turbines erected on the main island. That scheme finally won legal approval in 2015 but construction has yet to begin; it is waiting for a UK government announcement on new energy supply deals and the installation of a national grid connection to mainland Scotland. Nova Innovation said the two turbines installed so far were operating at 40% of their installed capacity. The company hopes its turbines, which were cofunded by the Belgian renewables company ELSA, will be sold worldwide now they have been commercially proven. “We are absolutely delighted to be the first company in the world to deploy a fully operational tidal array,” said Simon Forrest, the firm’s managing director.